Hilo features some of the best attractions in Hawaii. Let's take a look at just a few things that make Hilo and the surrounding area on Hawaii's Big Island so special. Hilo's bright, handsomely restored clapboard and stucco buildings near the bayfront are home to flower and antique shops, boutiques featuring the creations of local aloha wear designers, exotic ethnic restaurants, and fun hole-in-the-wall eateries with favorite Hawaii dishes. A lively farmers market offers exotic fruits, Hawaiian coffees, and vegetables, as well as local crafts, all at great prices – and even massage. The East Hawaii Cultural Center features always intriguing exhibits by local artists. The Pacific Tsunami Museum tells the dramatic stories of the 1946 and 1960 tsunamis that hit Hilo and the rest of Hawaii. The Lyman Museum and Mission House feature Hawaiian artifacts and natural history collections in a house built in 1839 by American Christian missionaries. The Imiloa Astronomy Center features stunning shows in its planetarium and memorable exhibits that explain (in English and Hawaiian) the importance of the stars to the early Polynesian voyagers who first discovered these islands. The interactive displays at the Mokupapapa Discovery Center open a window onto the Papahanaumokuakea Marine National Monument in the remote Northwest Hawaiian Islands. The Monument is Hawaii's second UNESCO World Heritage Site (the only other one is Hawaii Volcanoes National Park, just up the hill from Hilo town). Hilo is no "tourist town"- but there's plenty for a visitor to do there. It is an authentic community whose friendly long-time residents go back generations to sugar plantation workers who were immigrants largely from Japan and the Philippines. Hilo is the gateway to all of East Hawaii, a sometimes overlooked adventurer's paradise that stretches from the isolated Ka Lae peninsula – the southern-most point in the U.S. and a National Historic Landmark – where ocean-faring Polynesians first made landfall in Hawaii; to Hawaii Volcanoes National Park, where Kilauea volcano has been erupting since 1983; to the glistening jungles that tumble down-slope to the Puna coastline, where lava-heated ponds and clear tidepools speckle the shore. This diverse region is also where you'll find the Pana'ewa Rainforest Zoo, the only rainforest zoo in the U.S. (it's free! ), and the only winery on Hawaii Island, Volcano Winery. East Hawaii continues to the summit of Mauna Kea, the world's tallest mountain (measured from its base beneath the sea), and along the Hamakua Coast where silvery waterfalls, lush botanical gardens, and old sugar plantation towns lead to the raw beauty of Waipio Valley. Within this vast, diverse landscape, spirited travelers can choose from a menu of adventures or create their own, whether on foot, in the water, up in the air, harnessed to a zip line, on horseback, behind the wheel, seated at a table – or all of the above. A great company to check out is KapohoKine Adventures, based in Hilo, which offers many exciting tours. You can get a good taste of East Hawaii Island in just two or three days, but a week could easily be filled with exciting fun. 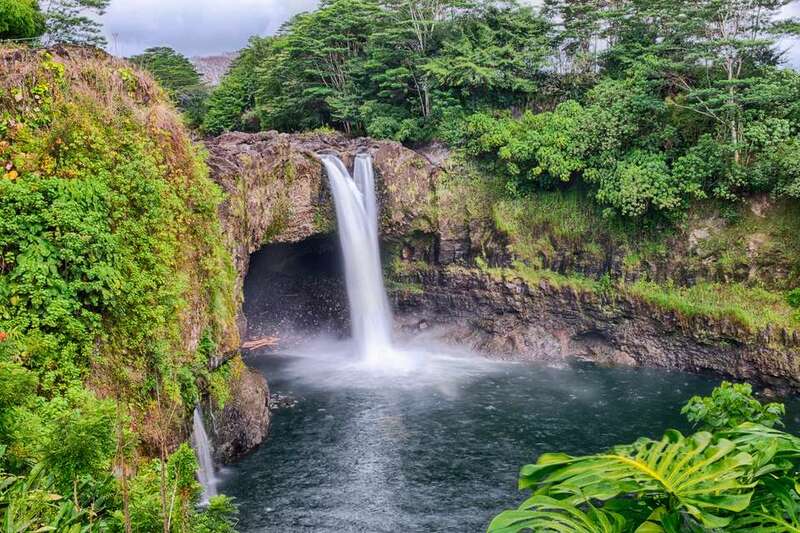 Instead of grand five-star resorts, the Hilo area offers a variety of excellent inns, bed & breakfast cottages, hostels, and good family-friendly hotels, as well as comfortable cabins and campgrounds. What Hilo town and the outlying districts are not is partly what makes the area so appealing. Two of the most popular hotels are the Hilo Hawaiian Hotel and the Hilo Naniloa Hotel, both located on Banyan Drive, next to Kapiolani Park and just a short walk or ride to downtown. Hawaii's human history began at Ka Lae in the Kau District where the Marquesans first made landfall between 500 A.D. and 800 A.D. There are no broad, manicured white sand beaches in East Hawaii, but no one seems to miss them. Hilo town locals flock to the little coves and beach parks along Kalanianaole Avenue in Keaukaha for picnicking, snorkeling, and splashing in the tidepools. Farther afield, around East Hawaii, there are black sand beaches and secret snorkel spots to explore along the dramatic, lava-rock shorelines of the Hamakua Coast and Puna Coast.